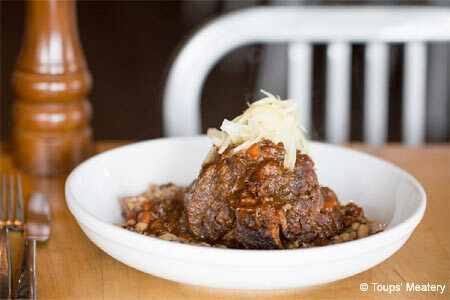 As the name implies, meat defines the menu at Toups’. : Barbecued goat, anyone? How about venison with caramelized onion barley, or pork breast lettuce wraps? Carnivores unite and find your way to Toups’ for small and large plates mostly built around a variety of meats. The array includes everything from lamb and steak to quail. There are few fowl offerings as this place is decidedly for meat lovers. Chef Isaac Toups, well known to area residents from his time in the kitchen at Emeril’s Delmonico Restaurant, is serious about his love of all things Creole --- witness the boudin balls, cracklins and hog’s head cheese. The Toups’ Burger combines pork and beef and is enhanced with bacon, cheddar, squash and herbed aïoli. While the menu isn’t lengthy, the wine list is surprisingly diverse, noting full-bodied reds that pair nicely with the chef’s Meatery Board as well as lighter reds and a respectable list of whites. For dessert, remember to ask for the salted caramel, peanut butter and bacon Doberge cake or the chocolate mousse spiked with cayenne and cane syrup. The owners have done a nice job of creating a true neighborhood restaurant atmosphere, with the bar as the focal point of the compact space, and ceiling fans whirring under industrial-style lighting.